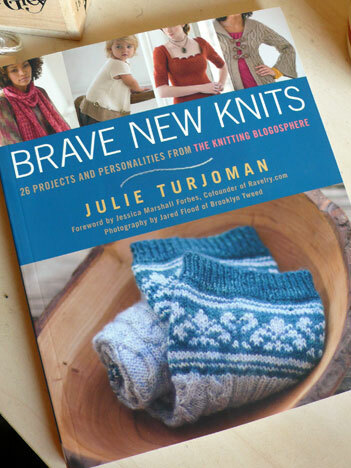 some time back, julie turjoman contacted me to ask if i would participate in her new book project, brave new knits. 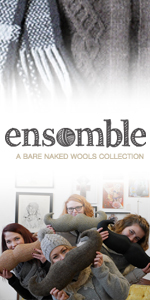 last summer we met on a warm august day to chat about knitting, design, and how emerging designers are establishing themselves by using the internet as a communication and business tool. throughout the fall and winter, julie sent updates on the progress of her book and then this august, the book hit the stores. after a couple of books went AWOL in the mail on their way to me, i finally received my copy this week and now i’ve had a much anticipated chance to see what everyone has been talking about. 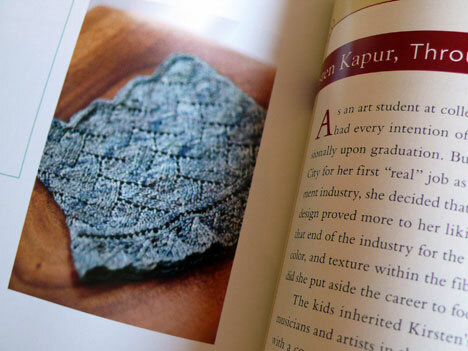 graced with beautiful photos by jared flood, this book is chock full of lovely projects by 26 up and coming fiber designers, augmented by thoughtful interviews and writings about the work through julie’s eyes. 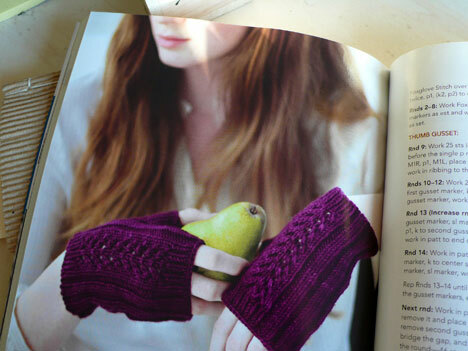 see, there’s my friend clara parkes; she contributed some beautiful mitts that i’ll show you in just a bit . . . let’s start at the beginning. 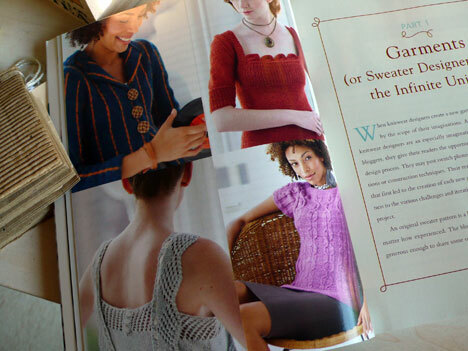 the first half of the book is devoted to sweater designers and the projects they contributed. included are sweaters of all types—dressy, casual, practical, and unusual. and somehow, i did not snap photos of any sweaters individually to show you, drat! there are several pieces that caught my eye as intriguing though; my favorite being the johnny rotten jacket. 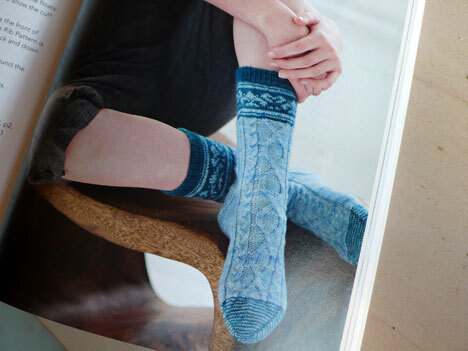 the second half of the book explores accessory projects and i guess unconsciously, that’s where my camera likes to dawdle—over designs that make a splash out of a skein or two of something special. this section is devoted to socks, scarves, shawls, mitts, and other portable sundries. it’s so clever and dramatic, and fun. i don’t know if i could wear it, but i really want to figure out who i could knit it for. i contributed a neckwarmer, the design inspired by my climbing hydrangea as it came into bud last spring, all of its sleeping branches, which looked dead one day, were covered with green promises of new life the next. seeing photos of it in the book was like seeing that climber brought to life all over again—it’s so different staged in living color. 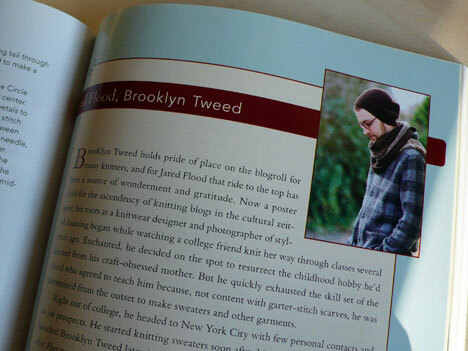 this is a beautiful book that will be a useful addition to any knitters library through the upcoming holiday season. the nicest part though, is that it will give back again after the new year, when we might go looking for warm, insightful stories to read as we pass the winter evenings. thank you julie for a beautiful book! I LOVE the neckwarmer!! It’s soft and pretty and reminds me of spring. It will be worth getting the book just for that! Just loved the book! Sorry it couldn’t be delered to Sweden. Why I don’t know? Ended up ordering 5 other books, but not the one I realy wanted. I too like this book very much! My Hydrangea neckwarmer (used Drops Alpaca in a lovely sage green) is almost finished. It was a pleasure to knit, and I plan to make some more in other shades. 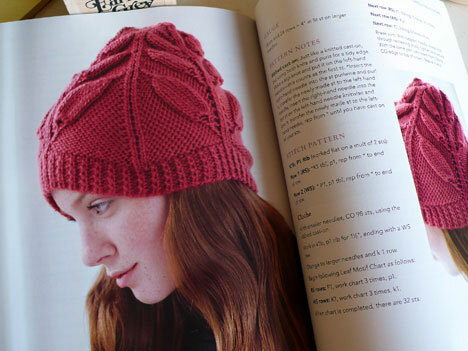 This pattern alone is worth the price for the book – and there are many other lovely patterns too. 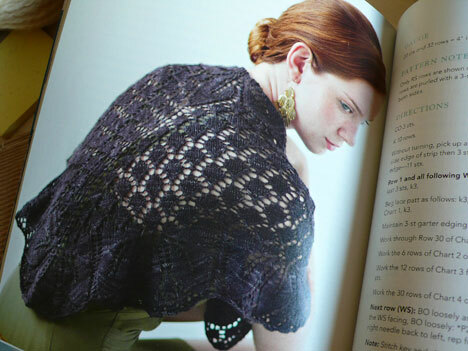 I agree, Brave New Knits is full of wonderful patterns. Your neckwarmer is beautiful. I think I may have picked up the perfect skein of yarn for it at Rhinebeck yesterday, a luscious blend of angora, silk & merino. It was really nice to finally meet you – however briefly. I just bought Brave New Knits and I completely agree with your description. 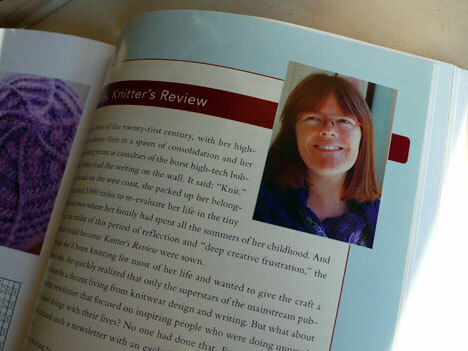 Thanks for contributing to a wonderful knitting book! That looks like a lovely book. I might just have to drop a few (rather unsubtle) hints to my other half as Christmas looms! I’ve had my eye on this book since I first came across it. Haven’t gotten it yet – but it will be coming soon, I’m sure. I’m so glad you were included. I’m sure it must get a little tiresome now and then for all of you wonderful blogging people – but speaking from the other side, as one of the readers – I’m very grateful for you. 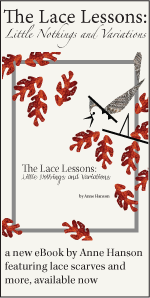 For years and years I knitted along in my own solitary way – unaware of so many of the fine yarns and designs available, if they didn’t show up at the LYS. The internet has been a wonder. The whole idea of networking has certainly come into it’s own in the fiber community. Because of your blog – and others like it, I’ve discovered fibers, spinners, dyers, patterns and techniques that I would have never known existed. Many thanks to Julie – and many thanks again to you and to all of the bloggers who keep people like me learning and enjoying the fiber more and more. The time and effort that you put into it has made a difference. I ordered it as soon as I saw your write-up. The neckwarmer is gorgeous! Got a copy for my Kindle! It’s great to have the orginal copy with me (along with any notes I make). The neckwarmer is beautiful. I agree with Liz – I have learned so much from the web. I went from a lone knitter to “belonging” to a community. And I always look forward to Anne’s posts. This is a book to have for sure! I checked out a copy of the book from my local library—I like to take time to really read through the patterns, etc. in a book before I decide to buy, and I am really excited about this title. Most of the designs are really wearable, no matter what your size or shape. 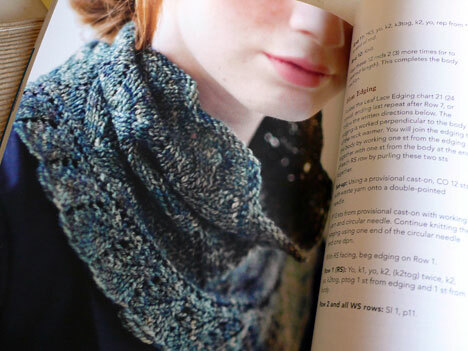 Your neckwarmer is beautiful, and there are some cardis in the book I want to knit as well. I bought this book last month at a book signing at WEBS. Love it and am looking forward to making a few of the projects. Julie was very nice and had all the book’s projects with her. Really helps to see them up close and personal. It’s a lovely book & thanks for the review. I stumbled across this at the library a couple weeks ago and fell in love with almost every pattern in it. Definitely on my Christmas list! 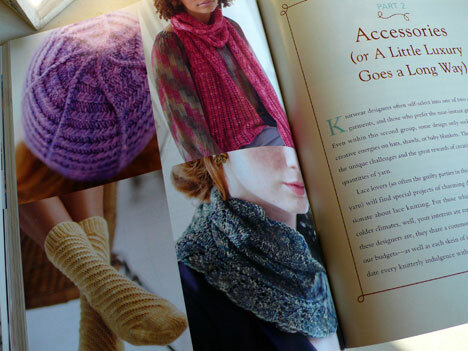 I’m going to make that neckwarmer with my Nimbus Cloud yarn. It will be sooo soft and warm. I love the book, too. It has some very interesting designs and techniques in it. What a lovel book. I definitely want it for the holidays. And what a lovely blog. I met you at NY Sheep and Wool with Maura and we thought maybe, possibly, could be, that we knew each other from somewhere. I still think it’s possible, but haven’t figured it out yet! I’m off to knit some bunny with maybe an eye to one of those lovely neckwarmer patterns. they all look so wonderful and would love to take part, but live so far away, down under. any one on face book? It all looks so scrumptious!